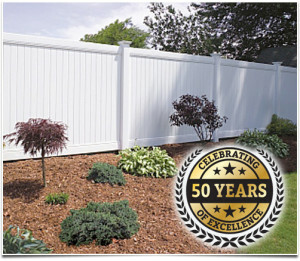 Anello Fence, LLC is one of Northern New Jersey’s few vinyl fence fabricators. Using our modern equipment, we can provide our customers with any custom designed PVC fence. In addition, Anello Fence, LLC manufactures custom designed wood fences. Since we manufacture both vinyl and wood fences, Anello Fence, LLC can provide our customers with any standard or custom designed fence to enhance the beauty of their home. Anello Fence, LLC also offers a wide array of styles of fences such as ornamental aluminum fence, as well as a complete line of residential and commercial link fencing. All of our fences can either be installed by professionals, or we can provide high quality materials for the “do-it-yourself” customer. As a member of both the American Fence Association, and the Garden State’s Chapter of the American Fence Association, Anello Fence LLC prides itself on the outstanding reputation we have built throughout our years of service. We have earned this superior reputation by providing our customers with the best VALUE possible, while satisfying fencing needs. We offer finer quality materials, superior service, and professional craftsmanship, all for the best possible PRICE! Our in house contractors provide all labor, including post digging and assembly at reasonable rates, so you won’t have to break your back or the bank to get a fence that’s right for you. Our experience and relationships with manufacturers allow us to offer parts and labor at unbeatable prices. Anello Fence, LLC is committed to providing the Northern New Jersey area with durable and attractive fences, keeping local homes safe with our first-rate secure fencing. At Anello Fence, LLC we are committed to completing every job, on time, within budget, and to your complete satisfaction. So whether your fencing needs are big or small, residential or commercial, installation or repair, count on us to provide quality without compromise. Our goal is 100% customer satisfaction, from your first phone call to set up an estimate for your fencing needs to the completed installation of your newly designed fence. Customers are welcome to visit our showroom, located at 50 Route 23 North in Pequannock NJ 07440, right across from Tiff’s Restaurant. Our friendly and courteous staff can assist you in choosing a style and material that best suits your needs. Call Anello Fence LLC today for all your fencing needs!